German jurisconsult of the first half of the nineteenth century; a brother of Jacob Raphael Fürstenthal. He embraced Christianity. 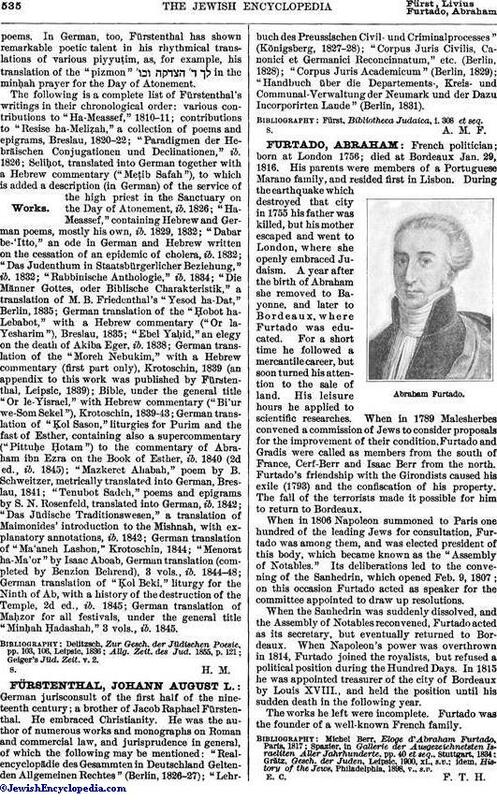 He was the author of numerous works and monographs on Roman and commercial law, and jurisprudence in general, of which the following may be mentioned: "Real-encyclopädie des Gesammten in Deutschland Geltenden Allgemeinen Rechtes" (Berlin, 1826-27);" Lehrbuch des Preussischen Civil- und Criminalprocesses" (Königsberg, 1827-28); "Corpus Juris Civilis, Canonici et Germanici Reconcinnatum," etc. (Berlin, 1828); "Corpus Juris Academicum" (Berlin, 1829); "Handbuch über die Departements-, Kreis- und Communal-Verwaltung der Neumark und der Dazu Incorporirten Lande" (Berlin, 1831). Fürst, Bibliotheca Judaica, i. 308 et seq.